Ah. . .I don’t know. . .Jonah and the whale? I was taking a group of high school juniors through a thought exercise as part of a Sunday School lesson last Sunday. I presented them with a table covered with about 20 household odds and ends. The point of the exercise was to hand an item to someone in the class and ask that person to come up with an analogy, or a parable using the item. Jesus taught people using wheat and tares, lost sheep and missing coins. I explained that He used those things because that’s what people understood. If He were alive today he’d be using things common to us. And that is the key to teaching anyone, from the youngest baby to the most seasoned IT professional. You have to make it personal. Chris was holding a stuffed dolphin or whale, we never did figure out which. I guess it could represent Jonah who got swallowed by a whale because he tried to run away from God. I was the last to participate. When it came my turn, I was handed the flag. It’s about 3″ by 1.5″. Here’s a picture. If you are familiar with flag etiquette, you might notice a problem with this flag. It’s backwards. Whenever the flag is displayed it should be displayed with the field of stars in the upper left corner. This patch has it wrong. This is a special flag. There is an exception to the “upper left” orientation. This is the shoulder patch of a United States soldier. Specifically, it goes on the right shoulder. The flag on a soldier’s uniform represents the standard that was carried into battle historically. In battle, if the blue field is pointed toward enemy it means the army is advancing. If the field of stars is pointed away from the enemy it means the army is retreating. Symbolically, our soldiers don’t retreat. 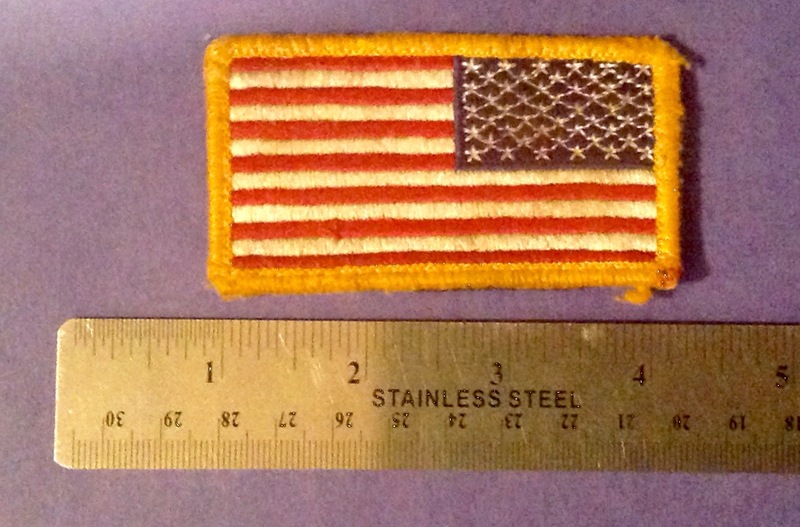 When worn on the right shoulder a “proper” orientation of the flag would show a flag retreating. This flag then, IS the proper orientation for a soldier’s uniform and any other orientation is wrong. I’ll explain the analogy I used for my Sunday School class full of ten 16 and 17 year old boys, and then I’ll explain how I think this simple flag has a message for all of us in business. To my class I explained that being a person of faith will put them at odds with many people in the world. They are being taught to not smoke, or drink alcohol, or coffee and tea. They are being taught sexual purity means waiting until they are married. Let’s face it, they are being taught some pretty old fashioned concepts. There will be people who will try to convince you that you are doing it wrong. That you are metaphorically going the wrong way. Drink a little. It won’t hurt you. A single cigarette won’t kill you. If you love her and she loves you, then you shouldn’t have to wait. But, just as the flag represents the direction a soldier is going, it also represents the very ideals that the soldier is committed to defending. It’s the “wrongness” of the flag that sets them apart. The young men will also commit to uphold standards that are bigger than themselves. It’s the fact that some in the world think they are doing it “wrong” that is an indication that they are on the right track. Wow, Brother Bliss. That’s really deep. The lesson of the backward flag applies in business as well. As an employee, you are representing your company. However, you should have your own set of values that guide you regardless of what norms your company has. Ideally, your personal beliefs will match up with company values. But, occasionally they won’t. I worked for a company one time that was actively breaking the law. It quickly became obvious that I couldn’t stay. A small software company I worked for was once asked to create a website for a spammer. Fortunately, my boss didn’t want anything to do with that line of business. If he had, I wouldn’t have stayed. At the times our personal values clash with those of our company we are like the flag above. To the world it might look like we are doing it wrong. But, the very fact that people feel that we are wrong, is an indication that we are doing it right.